If you or your guests are following a gluten-free or vegan diet this Thanksgiving, here are some unique recipe ideas for the feast that will satisfy. The gluten-free recipes include substitutes for dishes that typically have gluten, such as stuffing, while the vegan recipes can substitute for dishes that typically have animal products, such as turkey. Sure, you could substitute gluten-free bread for regular bread in stuffing and call it a day. 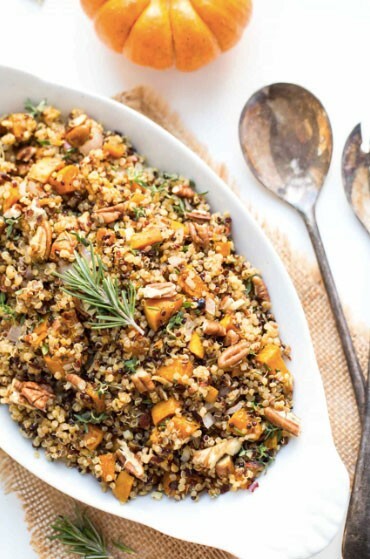 But you can also create an unconventional grain stuffing using quinoa, butternut squash, pecans, and lots of fall herbs. This classic cornbread is gluten-free and vegan, and incorporates aquafaba, (whipped chickpea brine), as an egg substitute. Gluten-free all-purpose flour substitutes for regular flour. If you eat a gluten-free diet, you can still enjoy warm, buttery pull-apart rolls at Thanksgiving dinner. These rolls use a gluten-free almond flour blend in place of all-purpose flour. This pumpkin pie is completely grain-free and dairy-free, so almost anyone with a dietary restriction of some kind can enjoy it. Almond flour makes a paleo crust and blended cashews give the pie a creamy filling without dairy. Seitan, a chewy meat substitute made from wheat gluten, makes for a great turkey replacement at a Thanksgiving table. This seitan roast is glazed with a savory red wine sauce and is surrounded by vegetables. Biscuits are usually loaded with butter, but these biscuits are essentially fat-free, using mashed potatoes to bind the dough. They are the perfect accompaniment to vegan mushroom gravy. Not all vegans are looking for a “meaty” main dish at their Thanksgiving tables. These stuffed squash halves are an elegant plant-based main dish that isn’t trying to imitate meat. Pecan pie is very rich, so this recipe replaces the butter and eggs with heart-healthy flaxseed meal and nut butter. It is also free of corn syrup and refined sugar. Lisa Drayer, M.A., R.D., is a nationally known nutritionist and health journalist. She is a contributor to CNN and is the author of THE BEAUTY DIET: Looking Great Has Never Been So Delicious (McGraw-Hill) and STRONG, SLIM, and 30! Eat Right, Stay Young, Feel Great and Look FABULOUS (McGraw-Hill). For more information, visit www.lisadrayer.com.